You can’t fail to be impressed by the bright lime green colour and mathematical perfection of romanesco. And its virtues extend beyond this marvellous appearance. With a crunchy texture and a nutty flavour somewhere between cauliflower and calabrese, it is one of the few ‘novelty’ veg that tastes better than its more common relatives. 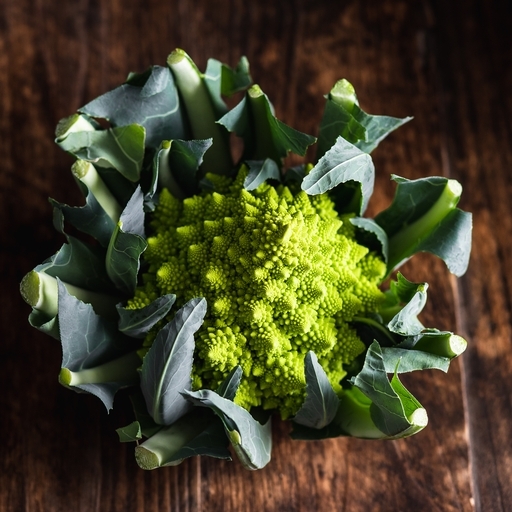 Approach romanesco in the same way you would standard cauliflower. A particular favourite is to divide it into florets and roast it for 10-15 mins until beginning to brown. Eat tossed with toasted pine nuts, plump currants, lemon zest, parsley and couscous for a lovely sweet and sour combination. With its stunning fractal patterns, romanesco is also a winner served whole. Pare away the leaves and base and boil or steam for 10-12 minutes, until just tender. Shock in cold water to keep its bright colour. Delivered from our farm, so wash before cooking. Romanesco keeps well, longer than calabrese (more like cauliflower) but it's best to keep it in the fridge. It is in season through the late summer, autumn and early winter but is easily damaged by hard frosts.